Nice! How many Man Utd. shirts will each holder hold? Two rolls? You're joking! I'd need a holder for about 26 in my house! Does it hold kitchen roll? Just had a vindaloo. One for each permutation of your name? M R S W I tch, my mum was part Swedish, part Dutch, part French and part Mexican. She weird. You sad sack of S.
Not a good look. Why?? i used to work in a toilet roll factory I started at the bottom and wiped my way to the top !!! 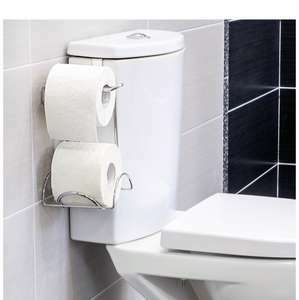 looking at how the toilet roll slides in on top of the holder I wish it was the opposite way around as it wouldn't be towards my bath tub & shower this way. No one likes wet toilet roll. Any idea where I can get the same design but to fit the other side of the cistern pls? I got one of these in b&m for about £3. Pretty sure splashbacks and misfires would ruin a fair few rolls!